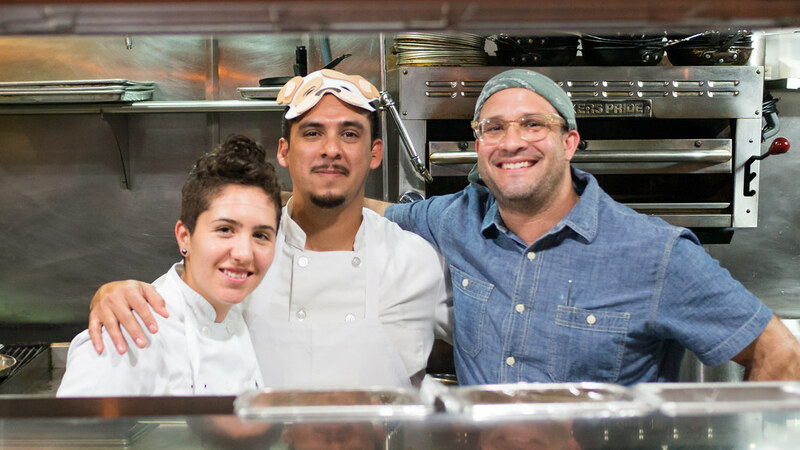 There is no requirement that chefs have a "theme" when they do a Cobaya dinner - but it sure makes things fun. 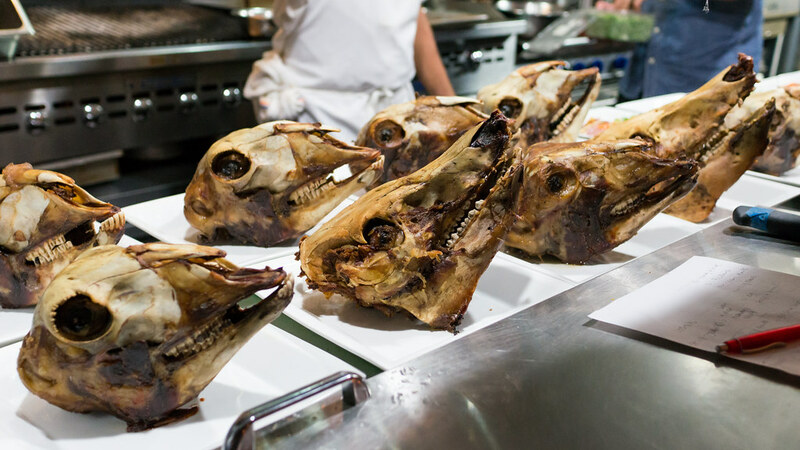 For our dinner a couple weeks ago with Chef Jacob Anaya of OTC Restaurant in Brickell, he went with an animal heads theme. 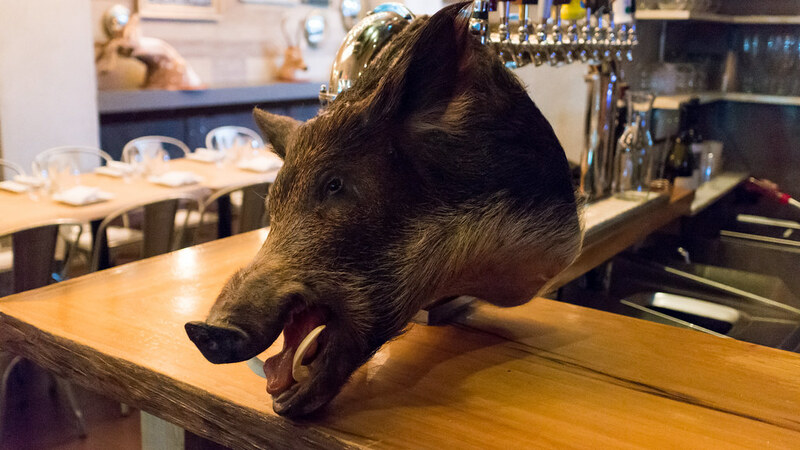 The theme played out in the decorations (taxidermy trophies mounted throughout the dining room), the staff (who wore animal-face masks all evening) and on the plate, where every dish used parts of at least one animal head. 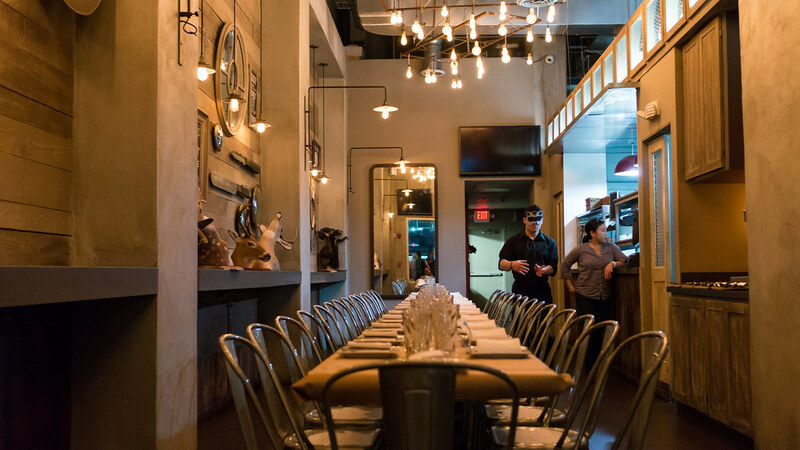 Chef Jacob Anaya is actually a Cobaya veteran - when we had our Cobaya dinner at Azul restaurant a couple years ago (the one that Bizarre Foods' Andrew Zimmern joined us for), Anaya was in the kitchen with Azul's then-executive chef, Joel Huff. When Huff left the following year, Anaya took over Azul, and more recently left Azul himself to run the kitchen at OTC. 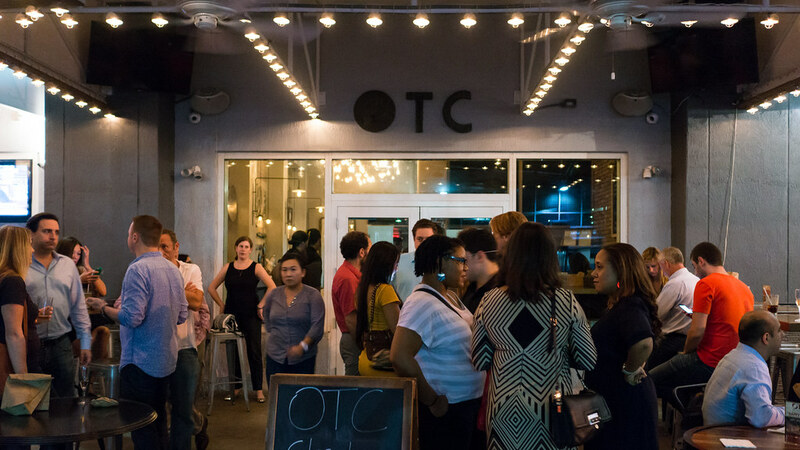 When OTC first opened it pitched itself as a casual, comfort-food place, but with the addition of Anaya, OTC and its owner Michael Sullivan are looking to step up their game. Since we had an idea of what Chef Anaya was capable of from his work at Azul, we gave him the Cobaya green light. Even the menu itself followed through on the theme of the night. (You can see all my pictures in this CobayaAnaya flickr set). The evening started on OTC's patio facing out onto Miami Avenue with a series of passed around snacks - brown-bagged crispy fried pig's ears dusted with smoked salt, citrus dust and chili powder, rice crackers shaken with tapioca maltodextrin cheese dust, sgaghetti squash twirled on forks along with espelette dusted goat ricotta and kabocha chips, grilled squid heads paired with an anchovy mousse, garlic dust and tiny greens. The first plated course - dubbed "Hard-Headed" - led off with a local lobster crudo, served family style. 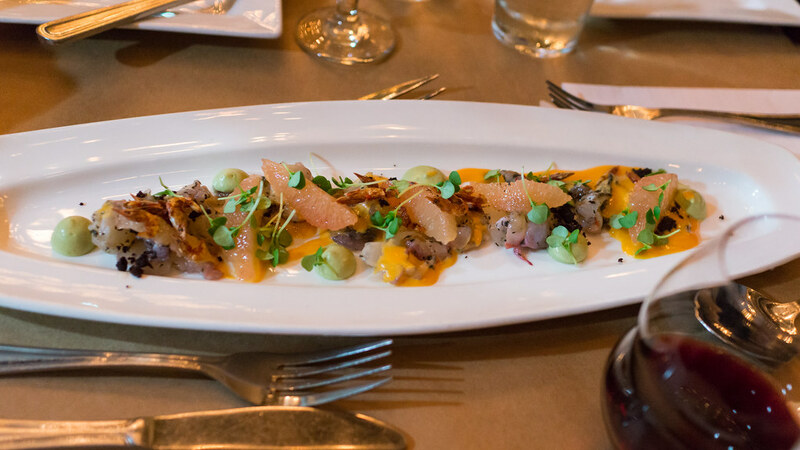 The raw lobster was paired with an orange-hued sauce made from the lobsters' heads with an intense crustacean flavor, a green olive purée along with crumbles of dehydrated black olives, supremes of ruby grapefruit, and chewy, salty dried shrimp. There were lots of strong flavors here, but they balanced rather than competed, the pairing of olive and citrus in particular striking a resonant Mediterranean chord. 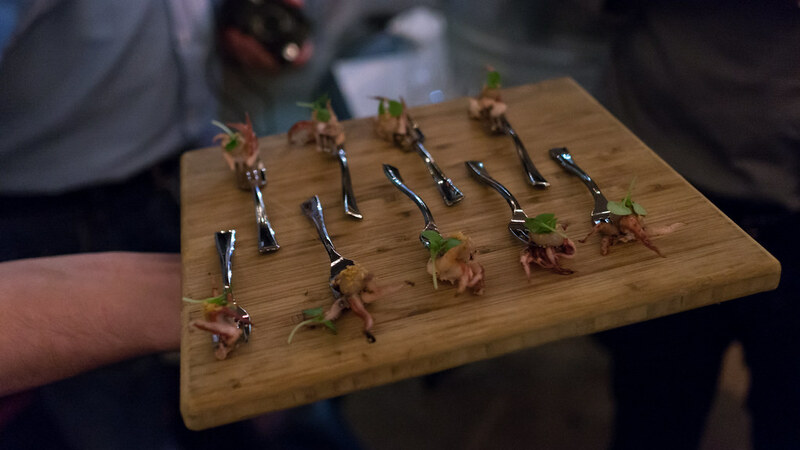 That was followed by a dish Jacob called "Two Heads Are Better Than One" - the first head being a slab of tender, meaty pork headcheese, the second being a fish-head broth that was poured into the bowl tableside. 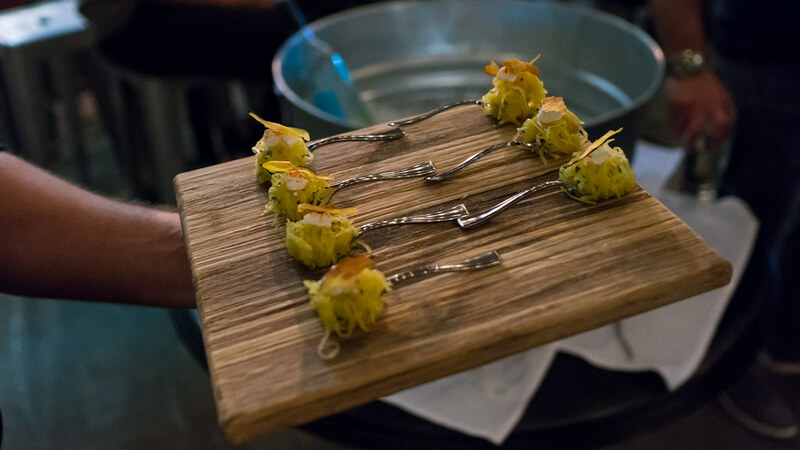 The rest of the dish featured ribbons of thinly sliced squid "noodles," a glossy, translucent black preserved "century egg," powdered green chive oil, and fresh chive tips. I loved the surf-n-turf interplay of flavors here, along with the variety of textures, and I'm also, for reasons I can't fully explain, a fan of the weird, almost sulfuric funk of preserved eggs. I only wished that the broth had been warmer to offer some temperature contrast as well. 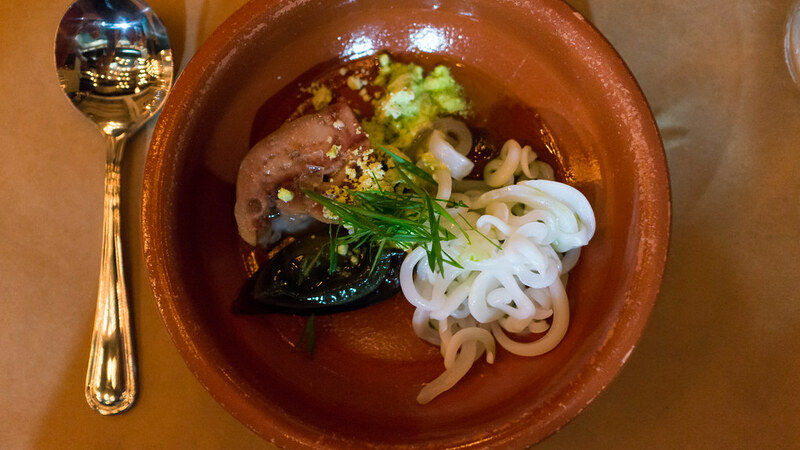 But this was the kind of dish that gets me excited - a combination that I have never seen and would never expect, but which upon tasting it makes perfect sense. The next dish - "Cheeky Guys & Gals" - again played with the surf-n-turf idea, pairing braised veal cheeks with sous-vide grouper cheeks. What I liked most here were the sauces - a silky, brightly flavored red pepper glaze, as well as a creamy celery root purée, reinforced by celery in multiple iterations - picked leaves, shaved ribbons, pickled disks of celery root, which together reminded me of the flavors of buffalo-style chicken wings in the very best possible way. 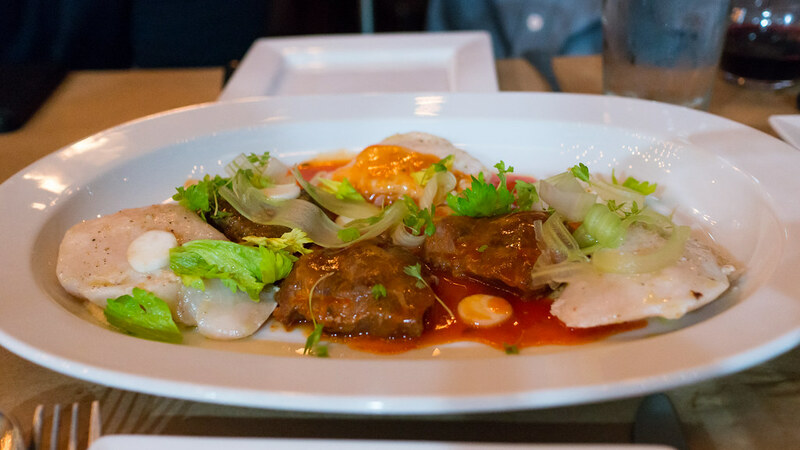 I wasn't as convinced that pairing the grouper cheeks with the veal cheeks really elevated one or the other, though the veal cheeks in particular on their own were very nice. 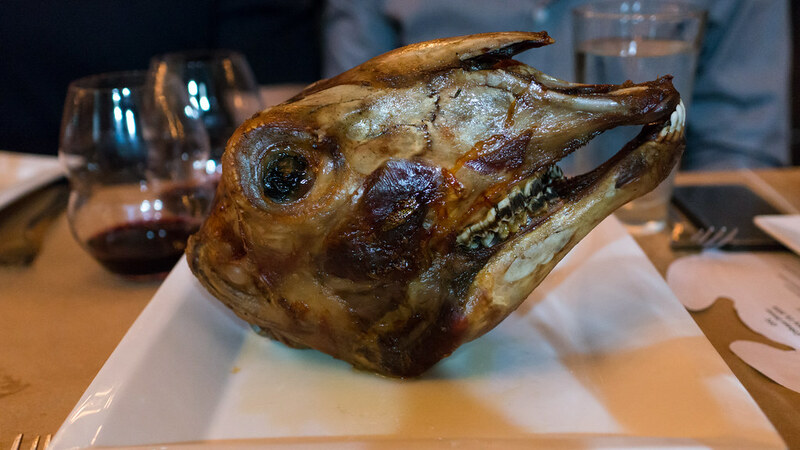 The final savory course made for a dramatic presentation fully in keeping with the theme - a whole roasted lamb's head. After I plucked the meat off the skull from the cheek and behind the eye socket, the server took it back into the kitchen to split the skull and provide access to the brain - which was soft, creamy and a bit gamy. 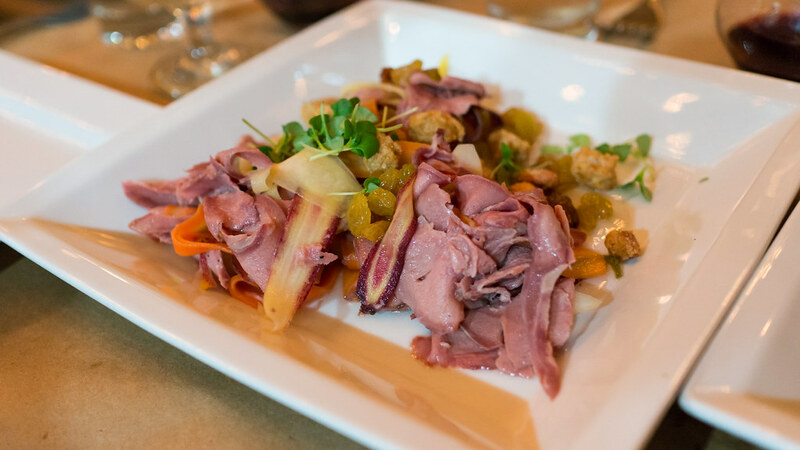 Meanwhile, they also served up a salad of thinly sliced lamb's tongue together with shaved rainbow carrots and plump golden raisins in a white balsamic dressing. This was possibly the dish of the night - the meat silky and tender, but richly flavored, balanced by the sweet, tangy and vegetal notes of the salad. 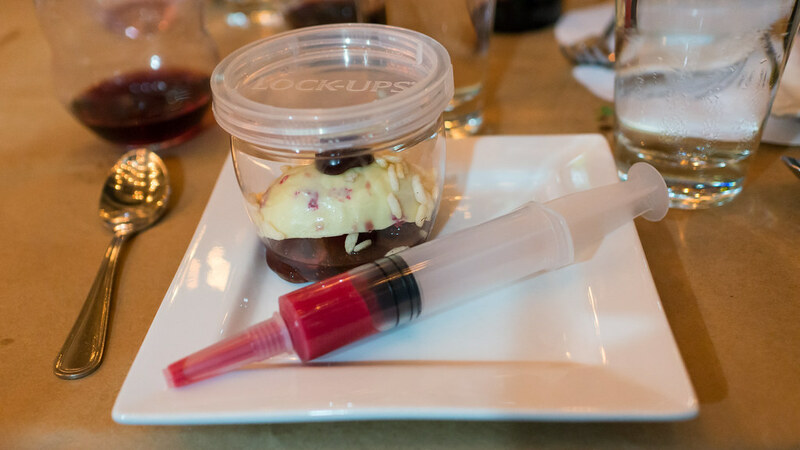 For dessert, something fitting with the experimental nature of our dinners: "It's Not Brain Surgery," combining red velvet cake topped with a white chocolate dome, "drunken" and smoked cherries, and a raspberry purée which could be "injected' tableside. 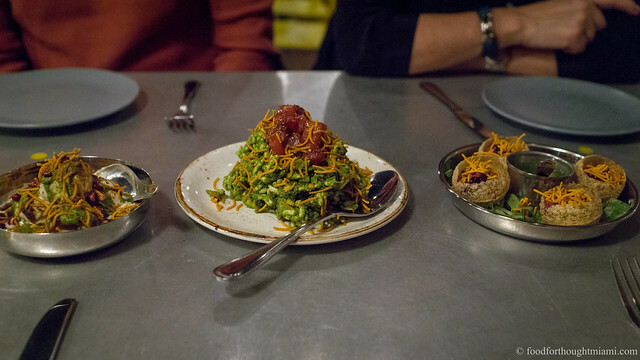 I really enjoyed the spirit of this dinner - not just the animal head theme and the goofy titles for the dishes, but Anaya's playfulness when it comes to technique and flavor. 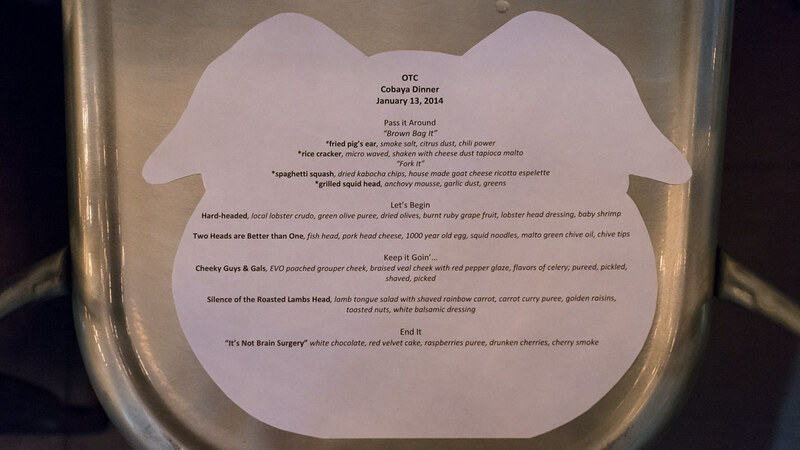 A hearty thank you to Chef Anaya and all of the crew at OTC, to John and Michael Sullivan for giving Jacob and us the chance to do this dinner, and as always most of all, to the guinea pigs whose interest and support make these kind of events possible. Though I usually like grouper cheeks, I found these somewhat undercooked in spots.